* Cf. 2Cor 12:9: “My grace is sufficient for thee.” Vulgate: “sufficit tibi gratia mea”. – The name “Jova,” albeit an abbreviation of the Biblical “Jehova,” is in the same time an elegant allusion to the classical name “Jovis” of Jupiter, father of the gods. In the Hague, on January 4, 1715. Jacobus de Kempenaer was born on September 5, 1666 in Amsterdam. 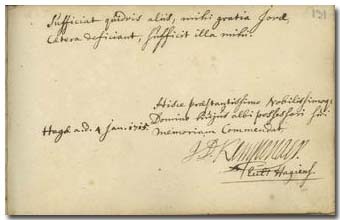 He was immatriculated on September 4, 1683 at the faculty of philosophy of the academy of Franeker. In 1692 he became pastor of Pingjum, and after two years of Bolsward. From 1697 he was pastor in Haarlem, and from 1706 in The Hague. He died on April 3, 1726. Kempenaer made his note in the Album of Ferenc Pápai Páriz in January of 1715, when he was pastor in The Hague. The Album preserves another note from The Hague, written in the previous December by the German physician Joannes Aegidius Euth living in that town (p. 192). – Another note of Kempenaer, written on July 1, 1721, can be read in the Album of the pastor Guilielmus Wigboldi fil. Muilman (1697-1759) [Den Haag, Koninklijke Bibliotheek, 74 H 26].